allow me to share a story about ethan that i’ll always remember: saturday morning, when asked to join his grandma and aunt nikki on a trip to the store to purchase some balloons for his uncle brandon’s high school graduation party that night, ethan declined to go. when i asked him why, he scrunched up his little face and said, “i don’t like balloons because they fly away.” i thought, well that makes total 4-year-old sense. 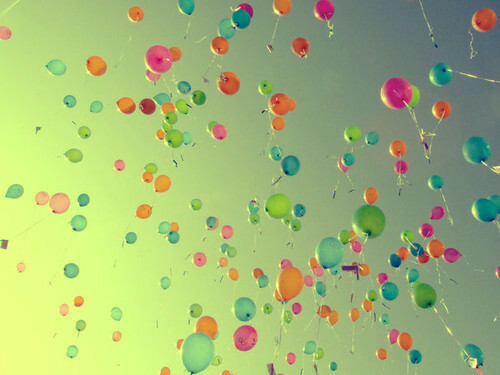 that evening, as we left the graduation party and piled out into the parking lot, someone accidentally let go of the bunch of balloons and they floated up into the sky. we all watched them soar towards the atmosphere and i felt a little tug on my hand and looked down at ethan’s watery eyes and trembling chin. my heart ached and i picked him up and told him — on the spot — that when balloons fly away it’s because they’re on their way to another party to make another kid happy, and miraculously, he believed me. sweet e, i hope you’ll forgive me for telling a lie but your innocence is just too great a gift to behold and i’ll gladly make up stories about ridiculous things like balloons until you’re 35 if you let me. speaking of balloons: brian is 30! Beautiful story!! If we could all go back to the age of innocence.